Companies in Europe will invest more in supply chain technology in the coming years, with no less than 71 percent of the companies surveyed expecting to increase their spending for 2018. They feel compelled to do so in response to the changing market and changing customer needs, according to the findings from the joint European study of supply chain technology conducted by Gartner and Supply Chain Media last year. This research will be carried out in Europe for the second consecutive year. For the past eight consecutive years, the American research and advisory company Gartner has collaborated with the American magazine Supply Chain Digest to investigate the role of supply chain technology in corporate strategy. This year, for the first time, Gartner has conducted a similar study in partnership with Supply Chain Media, publisher of this magazine, among supply chain managers and directors in Europe. The 158 respondents are active across all sectors, including retail and logistics service providers (accounting for 11 percent and 9 percent of the respondents respectively). The respondents are primarily responsible for supply chain strategy (69 percent) and supply chain planning (59 percent). Other responsibilities include customer service, supply chain systems, purchasing and production. The respondent profile can be characterised as senior managers: 45 percent are the final decision-maker or head of decision-making unit and 39 percent are part of a group that makes the final decision. When asked about the three most important business priorities for the supply chain organisation, 46 percent named driving process improvements and 41 percent said helping business growth. Reducing costs came third with 38 percent; one third of respondents stated improving customer service and customer retention. Looking at the results of the same study in the US, it is striking that business growth and customer service scored lower among the American respondents while process improvements, cost reduction and efficiency improvement were named more often. These differences could imply that the supply chain organisations within European companies are more outwardlooking than American ones, which focus more on costs and productivity. 29 percent of the European supply chain professionals regard new business models as the most important strategic change for their company over the next three years. This is not surprising in view of the emergence of new disruptive players such as Amazon, Alibaba, Zalando, Uber and Airbnb. The changing physical supply chain and changing customer base were mentioned by 16 percent and 13 percent respectively. This could possibly be explained by the rise of drones and 3D printing as well as shifts in customer needs and buying behaviour. When asked about the most important initiative in order to achieve the business priority, almost one third of the respondents mentioned increasing the maturity of Sales & Operations Planning (S&OP). Improving supply chain visibility and transparency scored second with 28 percent, followed by the redesign of the supply chain network at 27 percent. A quarter of those asked regarded customer collaboration and customer segmentation as the most important initiative. Notably, 31 percent of the American respondents mentioned the improvement of decisionmaking using business intelligence and analysis tools – over twice as many as their colleagues in Europe. The redesign of the supply chain network is the most-stated method for reducing costs. Customer segmentation and customer collaboration scores highest in terms of contributing to business growth. Better S&OP and better supply chain visibility are both mentioned most often as concrete process improvements. Improving the maturity of S&OP also scores highest in terms of improving customer service and retaining customers. When it comes to improving efficiency, the most common answer is rationalisation of stock keeping units in the product portfolio. According to the respondents, supply chain visibility makes the biggest contribution to process innovation and reducing total cycle times. The study also asked the respondents what they perceived as internal obstacles and the most important external threats for the supply chain organisation. Three quarters of them identify demand forecasting and insight into the chain as the key obstacle to accomplishing the supply chain objectives. Scoring just slightly lower, internal misalignment ranks second. Just under half of the respondents regard human resource-related challenges such as leadership and talent as an obstacle. Strikingly, the companies that say they perform better than their competitors – 41 percent of the respondents – name those challenges significantly less. This could mean that the leading companies have that aspect better under control. More than a third regard the external trade environment as the most important strategic threat for supply chains over the next five years. Incidentally, the companies who regard themselves as industry leaders mention this significantly more often than the companies with below-average performance. This implies that more successful companies are more aware of developments in international trade relations. Just under a quarter of the respondents identify leadership and organisation as the most important strategic threat. Almost three quarters of the respondents mention customer questions, expectations and needs as the primary force contributing to supply chain complexity. The rapid increase in product numbers and variants ranks in second place, with 56 percent. The growing volume and variety of data and expanding networks score 47 percent and 46 percent respectively. In the US, 40 percent of respondents view talent management as an aspect of this, compared to just one fifth of companies in Europe. At 51 percent, compliance is also mentioned significantly more often in the American study than in the European one. The survey clearly reveals that companies in Europe will invest more in supply chain technology in the coming years in response to the numerous challenges. Almost half of them are already seeing a rise in investment this year, while 40 percent see no change. For 2018, as many as 71 percent expect a rise and just 20 percent predict no change. Among the companies with above-average performance, the percentage growth is significantly higher than among those with below-average performance. 62 percent of the companies say they will invest more in analytical software this year than in 2015. Based on the same question, software for traditional planning purposes, such as forecasting and inventory management, and for S&OP scores 60 percent and 57 percent respectively. Around 5 percent of respondents indicate that they will invest less in these software categories this year. The investments in supply chain visibility and order management are considerably lower in Europe than in the US. One explanation for this could be that European supply chains are more complex due to lots of national legislation and taxation differences. 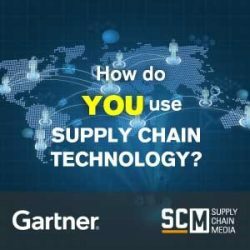 The collaboration between Gartner and Supply Chain Media aimed at providing important and unique insights into the industry from a European perspective will be continued in 2017. At this moment the reseach is being conducted for the second time.